Our Rat Control Treatment Pack 1 can be of use indoors or outdoors. * 1 x Advice Sheet, giving advice on how and where best to use the Rat Control Treatment Pack 1 for maximum effect. Please Note: The rat poison in this Rat Control Treatment Pack 1 has an attractant, which attracts the rats to eat it more quickly. 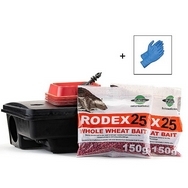 The Tamper Resistant rat poison bait box is weather resistant and lockable but if you use the bait trays outside, these should be protected so as to avoid weather damage of the loose rat poison.